Thanks to a $3.4 million federal grant, TriMet will purchase four battery-electric buses as part of the Federal Transit Administration (FTA) Low and No Emission Vehicle Deployment program. 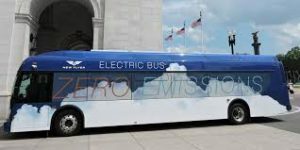 TriMet will purchase four New Flyer XE40 Xcelsior 40-foot-long battery-electric buses along with depot and on-route charging infrastructure. The federal grant covers all of the costs to buy the buses and design and install the infrastructure. These buses reduce emissions and greenhouse gases, and are also quieter. They are expected to be more reliable, and have the potential to offer extensive lifecycle cost savings from reduced maintenance and fuel costs. The new buses are expected to be operational in 2018. The buses would be deployed on a test basis on routes that match their charging requirements to determine whether further expansion of the electric fleet is cost-effective and meets customer service requirements. Over the long term, TriMet expects that the transit bus industry will ultimately transition away from conventional diesel engine propulsion to battery-electric propulsion. As industry experience and utilization of all-electric buses increases, TriMet expects that all-electric bus offerings will strengthen and diversify, performance and reliability will improve, and costs will continue to decline.